There is quite a bit of bad news in the market, but not all is bad – let’s not forget that the University of Virginia contributes hundreds of millions of dollars to the local economy and are in the midst of a $3 Billion dollar campaign. The planned influx of government jobs at the NGIC/DIA facility (story addressing this coming 23 September) will also have a positive impact on the Charlottesville market and economy. With that salve …. Sales volume is down, year over year, about 27%. Compared to the volume in 2006, sales are down about 40%. About 46% of homes currently under contract have days on market of under 60 days. Nearly 50% of Sellers have taken note that in order to sell their homes, they have to price their homes aggressively according to the market. 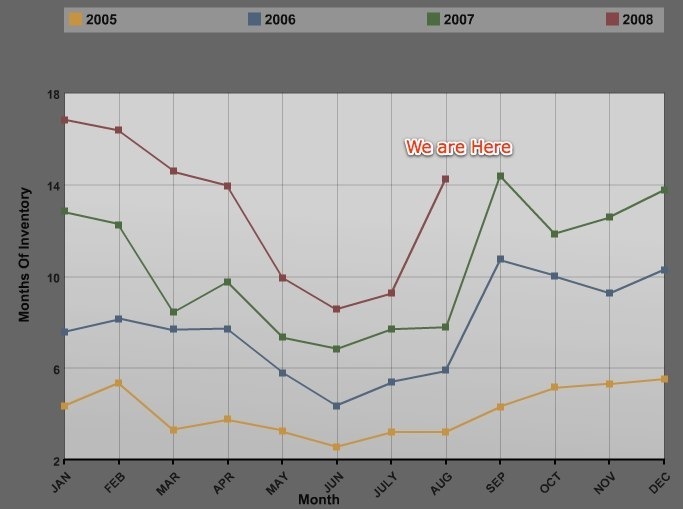 Days on market are up, year over year, average sales prices are up and median prices are about the same as 2007. For context, see the Second Quarter 2008 market report and all market statistics posts here. If you want a copy of the more comprehensive market report, including a further breakdown of condo properties in Charlottesville and Albemarle as well as new construction percentages, please email me. I’ll likely post it here next week. I don’t think (my opinion) that Louisa was as significant a part of our market four years ago as it is today. As I don’t break down the data by locality, I didn’t want to unnecessarily skew the data. 3 – “Now” for the purposes of this report, is Thursday, 4 September 2008. 4 – Source of all data is from the Charlottesville Area Association of Realtors’ MLS; while it is the best source of market data available and one can draw reasonable conclusions from said data, it is only as accurate as the people inputting the data. 5 – a â€œsideâ€ is a side of a transaction – the Realtor had either the Buyer or the Seller in a transaction. 6 – Absorption Rate – Number of weeks it takes to sell the current inventory at the present rate of sales. 7 – No keyword spamming was used in writing this report/post. I respect my readers, Google and the “purity” of real estate blogging too much to stoop to such levels. 9 – I am working on the Greater Augusta/Waynesboro market report. Please email me if you have specific questions. OK. I know there must be simple answer to this and or I have missed something, but “Why are you doing the 3rd quarter market report before September is over’? The NGIC/Rivanna jobs will get here about 2011. UVa and all state agencies have hiring freezes and face cuts. True about the billions pumped into the economy…but it’s not dollars that are going to buy the huge inventory of houses. That’s what needed…getting rid of the big inventory. There are 2,567 homes for sale in the Central VA area. Are the 381 homes under contract in Central Virginia area reflective of the same area that this number covers, or the wider area that the 3,609 homes for sale in the MLS # represents? We seem to have more than 14 months of supply here. This is more than the national average of 11 months. Anybody have any explanations for this? I always pull numbers only for Central Virginia, not for the entire MLS. It also stays in our sidebar. Great presentation of numbers as usual, Jim.